This easy recipe for Roast Duck with Apples or Kaczka Pieczona z Jabłkami is from Beata Zatorska's and Simon Target's "" (Tabula Books, 2011). 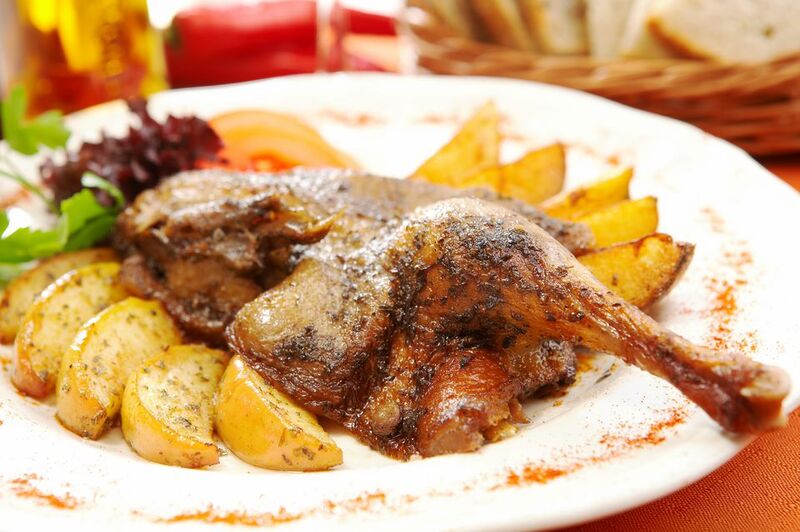 Zatorska says of this popular, traditional Polish dish "... [it's as] easy to roast a duck at home as a chicken. Roast duck goes down nicely with a bottle of dry red wine." I have my own memories of my Polish grandmother carrying home a live duck wrapped in butcher's paper, its head and feet sticking out. Much to my dismay, my new pet soon became duck's blood soup known as czarnina. Heat oven to 475 F/240 C. Rinse the duck with water and pat dry. Stuff the cavity with the apple chunks. Rub the skin well with the marjoram, garlic, salt and pepper. Place on a large plate, cover, and leave for 45 minutes to marinate. Place the duck in a roasting tray. Collect any marinade left in the plate, and add some more water to make up 1 cup of liquid. Pour this liquid around the duck in the roasting tray, not over it or you will wash off the marinade. Roast the duck uncovered for 10 minutes, then reduce the heat to 325 F /162 C and bake for 2 hours. Every 30 minutes or so, use a fine skewer to pierce the duck skin with holes to release its juices and then baste the duck with the liquid that collects in the bottom of the pan. Wash the potatoes and cut them into halves or quarters (there is no need to peel them). When the duck still has about 1 hour to cook, salt the potatoes, place them in the tray with the duck and sprinkle with caraway seeds. They should start to fry gently in the duck fat. When you next baste the duck, turn the potatoes, making sure they are well covered with the duck juices. Add another sprinkle of caraway seeds if you like. The duck should be cooked enough that it can be easily pulled apart and served in chunks.